Dear guests, thanks you for planning a visit to our city. We offer you a range of package deals including accommodation, sightseeing trips and leisure activities. All you need to do is enjoy the welcoming and vibrant city of Mainz. Our offers are based on a group size of minimum 15 people. If you travel in a smaller group, please contact us for our special small group packages. We are looking forward to welcoming you to our beautiful capital! Click here to explore our attractive group trip deals. Please note that our packages can be booked up to two weeks prior to your travel dates. 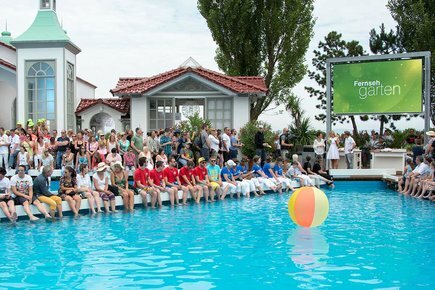 ZDF Fernsehgarten is a weekly live action show broadcast on German state television. Every Sunday from May to September, you have the opportunity to join the live audience on Lerchenberg and get a back-stage tour of the hit show. The popular presenter Andrea Kiewel known to her fans as "Kiwi" entertains the whole nation. Every week, Andrea Kiewel welcomes guests from all over the country and abroad to delight the audience with music and show acts. Each show has its own theme, from Mallorca Party and Oktoberfest to Disco Fox – offering something for everybody. Contact us for tickets and ask us for a tailor-made package deal. The broadcast on 04.08.2019 will not take place because of the DT Championships. ZDF reserves the right to change dates and cancellations. 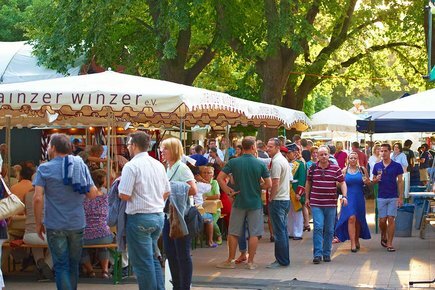 Sample local wines in a relaxed atmosphere under the old trees of Volkspark where more than 40 wine producers from all over Rheinhessen, Rheingau and Nahetal sell their produce. It's the perfect venue to meet the people of Mainz and experience the savoir-vivre for which the city is known.